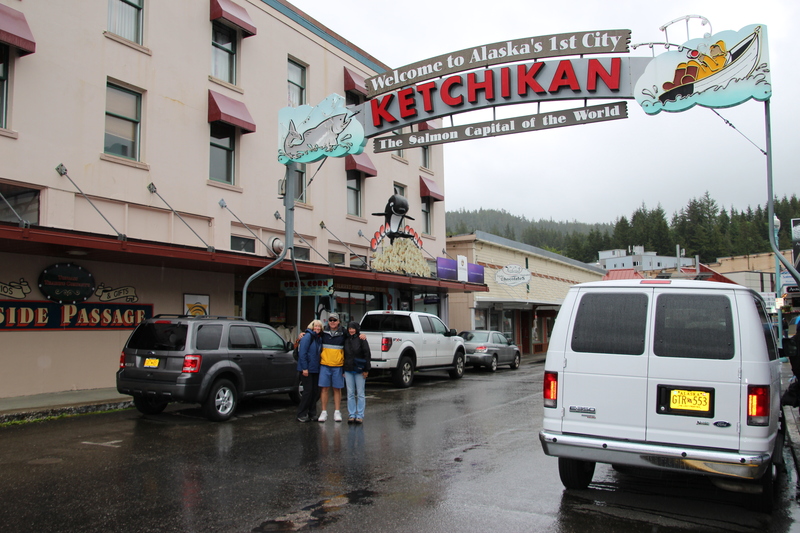 We spent Saturday with Chick and Carel exploring Ketchikan and eating lunch at Annabells. There were two cruise ships in and it was raining like crazy. Leaving Sunday was iffy with the weather but we decided to go around 1:00. We headed around the bend into the Behm Canal and decided to troll and do a little bit of fishing with no such luck on catching anything. So we headed to Naha Bay for the night. It was absolutely beautiful there. Ron and Chick took the dinghy and explored up the creek and into Roosevelt Bay where Trumpeter Swans are suppose to winter . This place had a 7 mile wildlife trail but had not been used for a while. There was a landslide by the float which took out the ramp so no access to land. The evening Sunset was awesome with the rain clouds. I guess you could call it a sunset in Alaska. The next day we headed to Neets Bay. Chick was not feeling well. 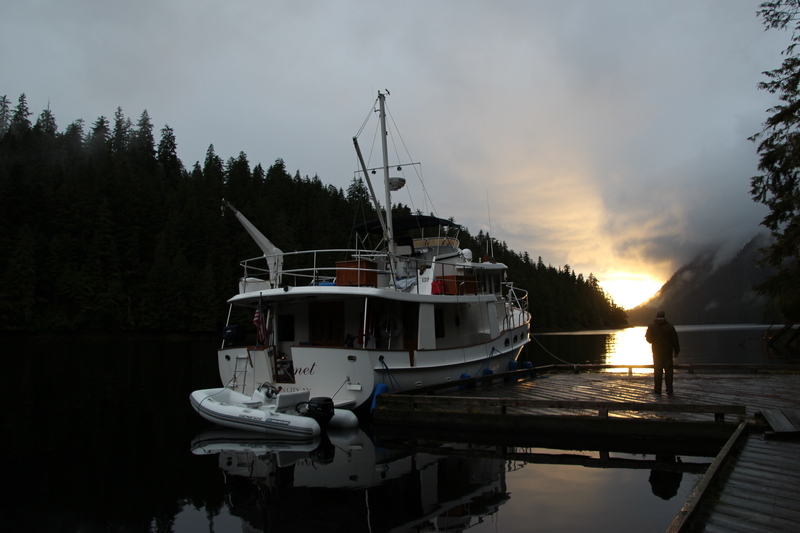 We fished a little bit but again nothing so on to Helm Bay we went for the night. Chick was sick for two days. Honestly I did not give him food poisoning must have been the stomach flu. We think he got sick because he lost at Mexican Train unfortunately Carel was sick the next day so I guess that was not it. Now they are both on the mend. After leaving Helm Bay we headed to Meyer’s Chuck. What a beautiful cove and you would never guess it was there. The sun was shining. We walked around the trail and ordered cinnamon rolls for the next morning by Cassie a local lady there that sold to all of the boaters. She delivered them in here little “dingy”. When we woke up the sun was gone and it was raining again. We went to Union Bay and fished for a while. Ron supposedly caught a red snapper but I can’t find it. Ron said that he moved it to the side because Bailey wanted it and said it must have gone out the scupper right…..After no such luck fishing and a storm appearing to be coming in we went on to Anan Bear Observatory. 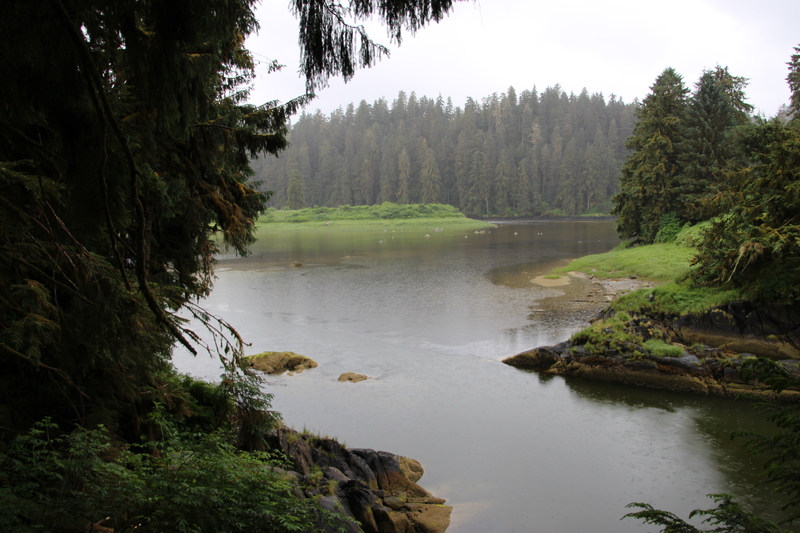 No bears yet….We took the dinghy to shore. The forest service really has this place cleaned up on the trails. Starting July 5 to August 25 you must have a permit to visit. Upon leaving the shore in the dinghy I decided to fall out and hit my knee on a rock. Boy did that hurt and it will for a while. Since anchoring was not great we decided to go to Frosty Bay for the night. There was a fishing boat off loading 50 gallon barrels of something to shore. There was several people on shore moving them. Looks like they had set up a camp of some sort. You see strange things out in t he middle of nowhere in Alaska. We went through the Blake Channel and it was beautiful so many waterfalls. I guess they have a lot of water here….well it’s been raining for days so why not water falls. We went on a skiff (speed boat) today through the Stikine River to the Shakes Glacier it was absolutely amazing. We even brought back a piece of glacier ice so Ron could put it in a scotch. Just prior to going we went through the museum which is very awesome for a small town. We would recommend coming to this town anytime. Still having a hard time with internet so when we can load pictures to your photo gallery I will let you know. Really enjoying your blogs, Lanette. On one hand, we’re learning about rugged conditions for hardy souls, and on the other, we’re hearing about glacier ice for scotches and beautiful sunsets that sound just right for luxurious living. Wonderful! Sue we are really glad you are on enjoying. It has been an adventure rugged and beautiful.